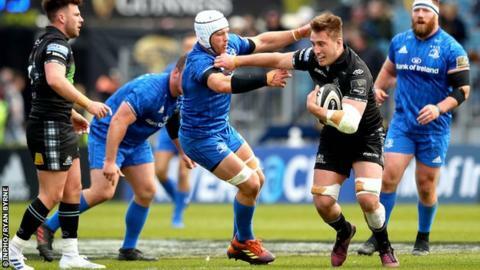 Glasgow Warriors claimed a rare victory over Leinster in Dublin to take a significant step towards to securing a home Pro14 semi-final. Warriors led 18-12 at the break, with tries from Sam Johnson and Tommy Seymour, added to eight points from the boot of Adam Hastings, cancelling out scores from Rob and Dave Kearney. Both Kearney brothers crossed again to put Leinster in control, but Glasgow's own set of brothers, Matt and Zander Fagerson, responded with tries and George Horne sealed a superb win. Warriors move to the summit of Conference A, three points clear of Munster ahead of a final-day meeting with Edinburgh. Munster threw the gauntlet down to Glasgow on Friday in the race for a home semi-final, their excellent win away to Benetton taking them two points clear at the top of their conference. Warriors knew a victory would put them back in the box seat going into the final round of regular season matches, but there was not so much on the line for Leinster with a home semi-final already in the bag and a Champions Cup last-four meeting with Toulouse coming up next weekend. Hastings kicked the visitors into an early lead after Seymour was tackled without the ball as he chased down his own kick ahead, with Leinster fly-half Ross Byrne sent to the sin bin for the cynical foul. Undeterred by their one-man numerical disadvantage, Leinster immediately hit back. The returning Devin Toner led the battering of the Glasgow line before the ball was shipped wide for Dave Kearney to step inside Stuart Hogg to score. Warriors response was superb. Hastings kicked them back in front before a searing Ali Price break set-up Johnson for a fantastic try. Without their talisman, Johnny Sexton, at 10, Leinster looked to be missing a little attacking imagination in the opening half. The basics done well tends to bring their own rewards, however, and a 10-minute spell of incessant pressure near the Warriors line ended with Rob Kearney joining his brother on the scoresheet. Glasgow came again, Hastings' excellent pass taking out three defenders to put Tommy Seymour over to give Warriors an 18-12 half-time lead. Leinster head coach Leo Cullen sent for his big guns at the break in the shape of Ireland front row trio Sean Cronin, Cian Healey and Tadhg Furlong, an indication of how Warriors had disrupted the home side's rhythm. Some of the Glasgow defence was heroic, but the blue waves just kept on coming and Rob Kearney blasted over for his second try, Byrne's conversion nudging the home side back in front. The European champions were starving Warriors of the ball and the mammoth defensive effort to try and keep Leinster at bay was starting to tell as Dave Kearney finished off a slick move to grab his second try for the home side. That could have been the cue for the floodgates to open, but Glasgow, with the excellent Jonny Gray at the heart of their efforts, went up the other end and fired back another shot. Matt Fagerson grounded after a rolling line-out maul and Hastings kicked the conversion to take his side back in front at 25-24. Perhaps inspired by the free-scoring Kearney brothers' and his own sibling's try, Zander Fagerson got in the act, powering over from close range to take Glasgow eight points clear and Horne's last-gasp interception score sealed the deal. This was Glasgow's day. A first win over Leinster in Dublin since 2011 and Warriors' Pro14 destiny is in their own hands heading into the final day of the regular season. Leinster: R Kearney; Larmour, Tomane, Henshaw, D Kearney; R Byrne, Gibson-Park; E Byrne, Tracy, Bent; Toner, Dunne; Murphy, O'Brien (capt), Doris. Replacements: Cronin, Healy, Furlong, Connors, Deegan, O'Sullivan, Frawley, A Byrne. Glasgow Warriors: Hogg; Seymour, Steyn, Johnson, Matawalu; Hastings, Price; Bhatti, Brown, Fagerson; Cummings, Gray; Harley, Fusaro (capt), Fagerson. Replacements: Stewart, Allan, Rae, Flockhart, Ashe, G Horne, P Horne, Jones.